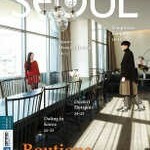 SEOUL Magazine would like to host a panel discussion on studying overseas for our March issue. We are looking for international students studying in Korea and Korean students who have studied or are studying overseas who can talk about their experiences. If you’re interested, please email Claire at english@seoulselection.com: include your name, age, occupation, in which countries you’ve studied, when you’d be available and, in the case of international students in Korea, how long you’ve been here. 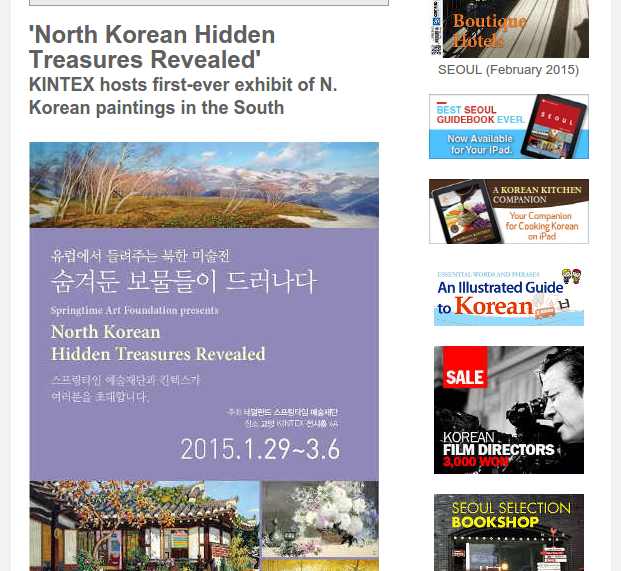 The Springtime Art Foundation of the Netherlands presents “North Korean Hidden Treasures Revealed,” an exhibition of about 150 paintings by 70 North Korean artists, some of whom are international award-winners. The exhibition, which has already toured Europe, is the first exhibition featuring artwork by North Korean artists held in South Korea. Where does the Korean work culture comes from? Korea is the third-largest exporter of beer to Iraq. It’s maesangi time in Jeollanam-do. Korean girls try American junk food. The results are not always good. Being a foreign woman in a Korean company. Sunrise at the pier in Jamjin-do, Incheon. When the Baikal ducks black out the sky. The Misaeng Bridge in Siheung. 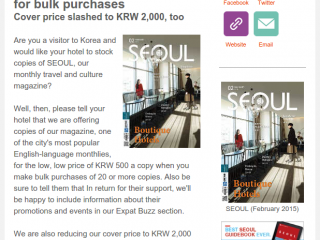 If you’re looking for a quiet, high-end place to live in Seoul, Rent Korea is the place to go. Rent Korea has 15 years of experience helping international residents of Seoul and Korea relocate and find rental properties. They’ll find exactly what you’re looking for, from apartments to houses. MORE INFO: T. 02-755-0001, 010-4323-0991 (Juile), hello@rentCorea.com. See this website, too. There are many boys choirs that visit Korea during the New Year season, but none can match the history and tradition of the Vienna Boys Choir. The roots of the choir date back to the 15th century court of Maximilian I, the Holy Roman Emperor. In 1498, by the order of the Emperor, the choir was established to accompany music during mass. There are countless musicians and composers that have gone through the choir since then. Shubert and Haydn were members of the choir, Beethoven and Mozart have conducted the choir, and Brukner wrote hymnals for the choir. The legacy continues to this day as the choir performs with the worldâs finest orchestras, such as the Vienna Philharmonic and the London Philharmonic. The choir selects its members through auditions that occur only twice a year. Once recruited as a member, the boys move into Palais Augarten, which serves as a boarding school for the choir. The boys go through extensive training, and when they turn ten, they get placed into sub-groups Mozart, Shubert, Haydn and Brukner for world tours and recording projects. The New Yearâs concert program will include medieval chants, waltzes, polka and folk music from around the globe. The choir will tour around other cities in Korea as well. Other than Seoul, they will be visiting Jeonju, Busan, Yeosu, Namdong and Nowon. Members of the African diasporas around the world have joined artists living in Africa to present a collection of works showcasing contemporary movements in African art. The exhibition will feature 21 artists and over 100 pieces, including installations, drawings, sculptures and films. The overarching theme of the collection will be a depiction of the struggle faced by Africa and Africans in relation to imperialism, minority identity, slavery, religious conflict, nationalism and multicultural issues in post-colonial societies. Overall, the exhibition is intended to provide an opportunity for Koreans to better understand the social plurality that African communities have fought so hard to achieve. This event will mark the first time that Korea has hosted a large-scale exhibition spotlighting works by African artists, and will include works from artists such as Yinka Shonibare, Chris Ofili and Kehinde Wiley. GETTING THERE: Walk along the Deoksugung Doldam-gil from Exit of City Hall Station, Line 1. Seoul Art Cinema is a movie theater run by local nonprofit the Korean Association of Cinematheques. Every year, Seoul Art Cinema holds the Cinematheque Friends Film Festival, an event where the organization invites its supporters to view notable films selected by notable film critics and directors. This yearâs selection panel includes directors such as Park Chan-wook and Bong Jun-ho, and most of the supporting directors and critics will also hold small panel discussions after the screening of the film they chose. For the festivalâs opening ceremony, Charlie Chaplinâs âCity Lightsâ will be screened along with a live music performance. ë¡3ê°ì­ (Lines 1, 3 or 5), Exit 5. Walk straight for 5 minutes. The theater is located in the Nagwon Arcade. A favorite “break the winter blahs” excursion, this will help to cure that feeling of cabin fever! The RAS prescription is to get out into the countryside and back in touch with nature. This excursion will take us to Gwangneung, the tomb of King Sejo and his queen, located near Seoul in a picturesque National Forest Reserve, and then on to the enchanting Sanjong Lake. Hangang Park on a cloudy winter day. Photographed by Robert Koehler.